He loves his little baby just as much as he loves his trains. I think people need to stop over reacting with the whole dolls are for girls and trucks are for boys thing. Just let your kid be who they are, play with what they want to play with. In the end, they will grow up to be the person who they were meant to be. 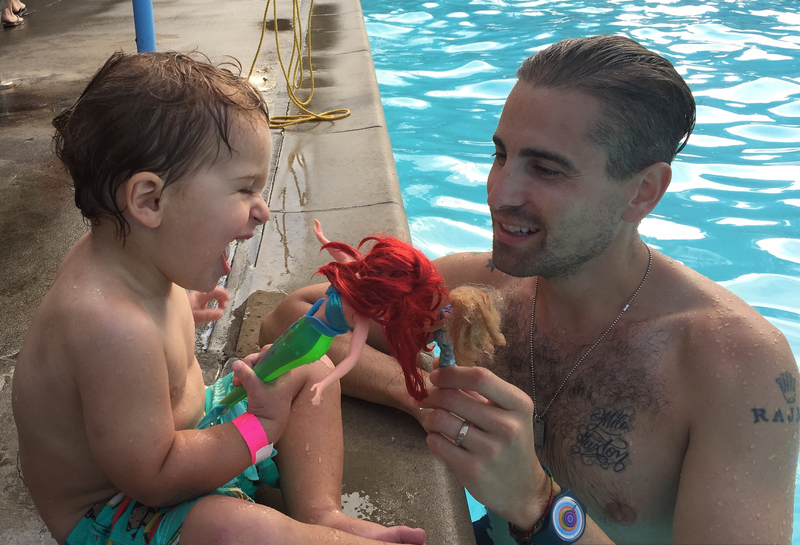 Milo saw an Ariel doll from The Little Mermaid at the side of a pool and said, "Whoa!" He grabbed it and started to play with it. Then the mother of the little girl whom the doll belonged to said to us, "Boys don't play with dolls!" 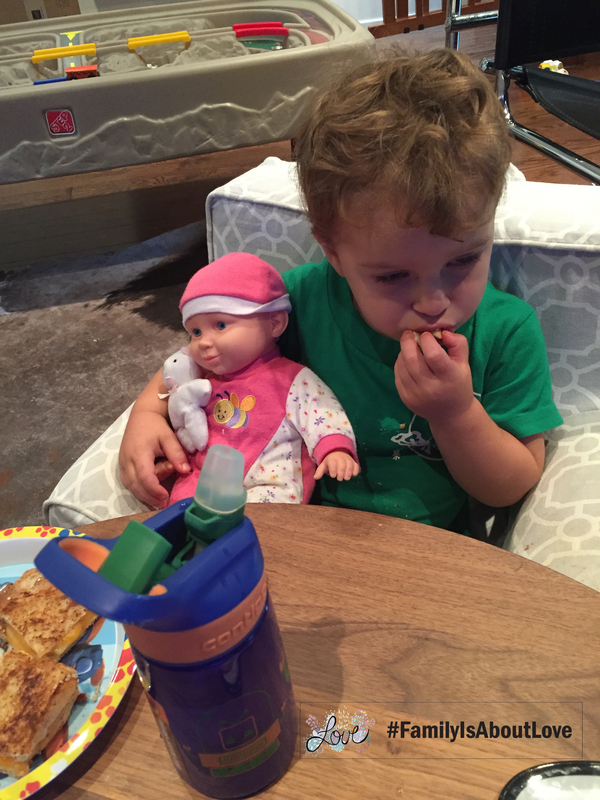 I am not quite sure why some parents are so against their boys playing with dolls, or taking dance, or even wearing pink. Her daughter (maybe five years old) said to her mom, "Boys play with trucks. Girls play with dolls." The mother said quietly to her daughter, "I know." She then asked us to leave the dolls at poolside when we are done playing and swam off. As Frank and I both looked at each other with bewilderment, another mother with her son swims up to us and says, "Just to let you know, my son plays with dolls. That was the stupidest thing she could say!" As much as we were astonished that this mother actually said this to us, we are not that surprised that some people still think like this. Gender-based toys and colours still seems to be an ongoing topic nowadays. Just last year, Target stopped gender labelling their toys. That of course had all the naysayers weighing in and voicing their opinion how ridiculous it is. But is it, really? Religious groups were calling for a boycott to shop there. Now THAT is ridiculous. Why are toys marketed toward girls in pink and mostly princesses? If a boy wants a princess doll, why is he labelled a "girl" or "gay?" Why are superheroes marketed mainly towards boys? Why is pink for girls and blue for boys? Last year we were in a restaurant in Miami, feeding Milo from a pink bottle. A woman in her early 60s who was sitting next to us turned to us and said, "Oh I thought your baby was a girl because he has a pink bottle!" To which Frank replied, "We don't believe pink is for girls!" As long as I could remember, I played Barbie with my sisters, and I also played with my Hot Wheels and He-Man figures. Although Frank used to hide to play with his sister's Barbies, times were different back then. The "Free To Be You And Me" album and song book by Marlo Thomas just came out, and that album helped open the minds of parents that it's perfectly normal for a boy to play with a doll. In our house there is no such thing as girly things or boy things, or "mommy jobs or daddy jobs." Is it because we are a gay dad family and there are no specific gender roles? Regardless of gender, in any household, the laundry needs to get washed, the dishes need to get cleaned, diapers need to get changed, the lawn needs to get mowed. My favourite question is always "So, who does the mommy stuff?" which is immediately followed up by, "Oh, I didn't mean it like that, but you know what I mean!" 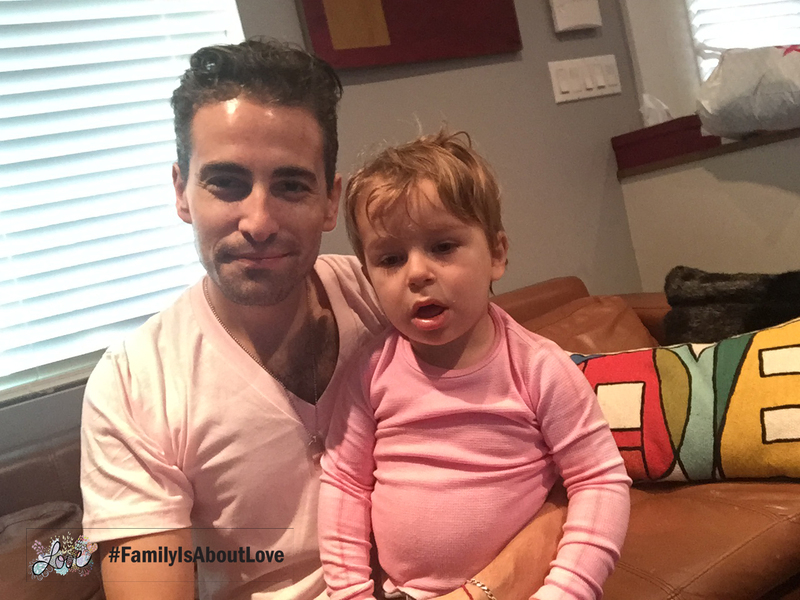 Frank and I both are Milo's father, mother, playmate, disciplinarian, caregiver, but most of all we are his parents. Milo will continue to wear pink, play with dolls, vacuum and clean, be a ballerina if he chooses to. He will use his imagination with whatever toy he is playing with, because a toy is a toy. He loves his little baby just as much as he loves his trains. I think people need to stop overreacting with the whole "dolls are for girls and trucks are for boys" thing. 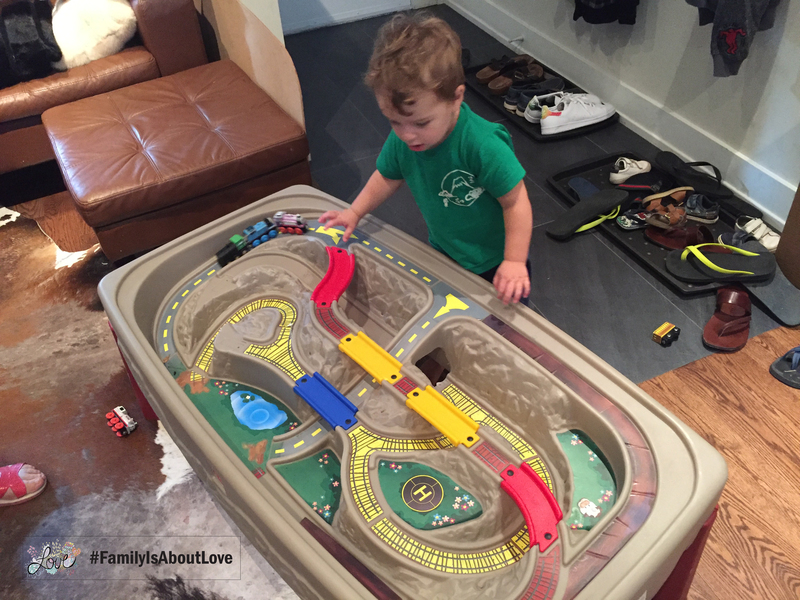 Just let your kid be who they are, play with what they want to play with. In the end, they will grow up to be the person who they were meant to be.